Laurel Shelton and her brother Hank are living out on farmland the locals say is cursed. And maybe it is. Laurel is born with a large birthmark that neighbors take as a sign of witchery. Hank loses an arm while serving overseas in WW I. When Hank falls in love with a woman who refuses to live there, Hank secretly plans to leave his sister behind. But Laurel’s fate is forever altered when she comes upon a stranger in the woods one day, a stranger she saves from a near-fatal accident. 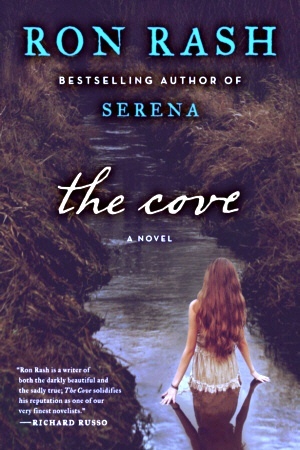 With only a simple haversack of worldly belongings, including his treasured flute and note explaining that he is mute and bound for New York, the stranger slowly insinuates himself into life in the Cove, helping Hank on the farm, playing his ethereal music in the long twilit evenings, and, eventually, bringing Laurel the only real happiness she has ever known. But where Laurel stumbles onto his real identity, she realizes the profound danger they are in, not only from an army recruiter determined to show his mettle by stoking fear and outrage over all things German (harassing an aging language professor at the nearby college, purging the library of any suspect foreign material), but also from her own brother, Hank, whose rage at the enemy who maimed him is barely contained beneath his placid surface. In a page-turning climax, these characters lock horns with history and reveal Ron Rash once again to be a masterful novelist at the height of his powers. When writers gather and tipple while discussing those not present at the table but admired, the name Ron Rash quickly comes up. He is a double-threat writer, great in both poetry and fiction. He uses language with such apparently effortless skill that it is as though he found words in his barn as a child and has been training them to fit his needs ever since. There’s not much he doesn’t know about humans in turmoil, or his region, a place where nothing ever changes until all of a sudden it does and often too much. Rash throws a big shadow now and it’s only going to get bigger and soon.